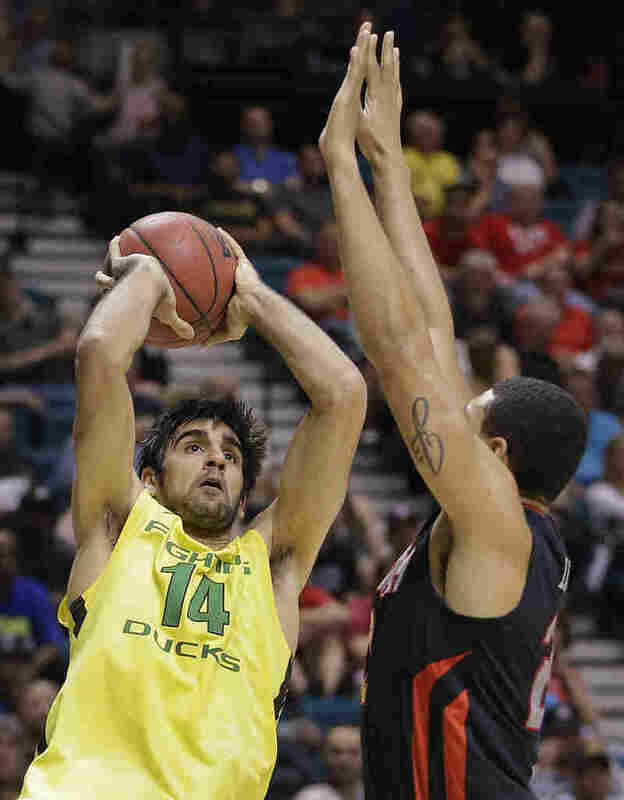 Oregon's Arsalan Kazemi: From Iran To NCAA Hoopla : The Two-Way Rebounding machine Arsalan Kazemi is the first Iranian-born player in Divison I men's college hoops. He's focused on helping the Ducks beat St. Louis on Saturday — and well aware of his role as a pioneer. Rebounding machine Arsalan Kazemi is the first Iranian-born player in Divison I men's college hoops. San Jose, Calif., is just a piece of a very big March Madness pie. But in the eight teams that gathered there for second- and third-round games this week, you could see the undeniable trend in big-time college basketball globalization. Rosters from schools as geographically diverse as Syracuse, New Mexico State and California featured athletes from Senegal, France, Canada, South Africa, Croatia, Sudan. But it's the University of Oregon with a groundbreaker — from Iran. Six-foot, 7-inch rebounding machine Arsalan Kazemi, a senior, is the first Iranian-born player in Division I men's college hoops. He's focused on helping the Ducks beat Saint Louis on Saturday with a trip to the Sweet 16 on the line. But at the same time, Kazemi understands his role as a pioneer from a country that has a difficult relationship with the United States. "Obviously a lot of people see the news on the TV," Kazemi said during a locker room interview with the press on Friday. "I try to be very humble. I try to represent my country as best as I can and play sport as best as I can and show people who I am." Since transferring from Rice University last year, Kazemi has become a popular and important member of a surging Ducks basketball team. In their first game of the tournament on Thursday, the 12th-seeded Ducks beat No. 5 Oklahoma State by 13 points. Kazemi was a force on the boards with 17 rebounds. He joked that his teammates complained he snatched away some of their opportunities to grab the ball. "I apologize to them if I get their rebound, but I just jump to get it, that's how it works," Kazemi said. That's how it has worked throughout his senior season. Kazemi was the third best rebounder in the Pac-12, averaging 9.5 rebounds a game. He's not a physically imposing player; instead, he says he relies on timing and position. Kazemi started learning the game when he fell in love with it as a 9-year-old in Iran. He excelled and ultimately became a top junior player in his country. Anthony Ibrahim, a family acquaintance, paved the way for Kazemi's jump to the United States, by contacting college scouts and coaches. Kazemi played high school ball for the Patterson School in North Carolina. Then he got several college scholarship offers. He chose Rice, in Houston, in part because that was Ibrahim's home. Kazemi played there three years. Last season he was one of several players who chose to leave the program. He never stated publicly why — although it was revealed there were allegations of racial discrimination, which Rice strongly denied. Regardless of happened there, Kazemi says he has had unpleasant experiences in his life as an athlete traveling around the U.S. He says he's been called a "terrorist," but tries not to listen. "I just try to focus between the lines," he says. Kazemi says he speaks to his parents by phone twice a day and after games. His parents have never watched him play a college basketball game in person. "Too hard to get a visa to come here," Kazemi says. But Roya finds computer links to her son's games and watches online, regardless of the hour. "She doesn't care how late, how early," Kazemi says, "she just watches and supports me all the time." Of course, a true indication of March Madness popularity would be if a devoted Iranian mother filled out a bracket. Kazemi laughs at the idea and said he doesn't know if she made tournament picks. "I should ask her, probably," he says, adding, "If she does, it's Oregon all the way." " 'We just decided as a team we're going to go out there and we don't care who we're going to play,' said Oregon's Arsalan Kazemi, who had eight points and 16 rebounds."